Thanks so much to everyone who came and supported the Walkatjurra Walkabout this year..
We have finished doing all the finances and we have come up $1,000 short.. (which is actually better than we expected) We also have the kitchen truck registration that is due at the end of October that is another $650.. The last week of the walk saw us leaving Poison creek after two well deserved rest days and some bathing and washing. There was a small billabong at Poison creek that the cows had fowled, so Aunty Lizzy a local traditional owned showed us all how to dig for water in the creek bed. 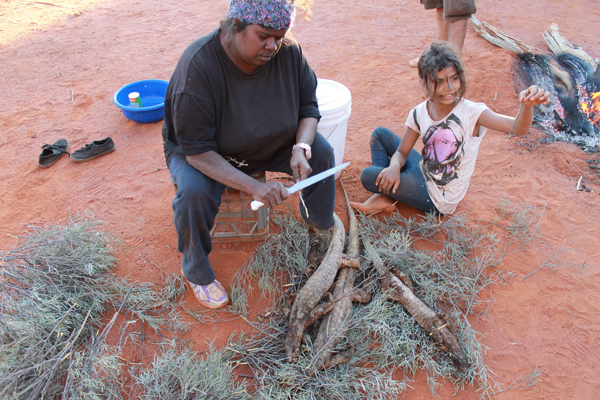 We dug three waterholes, two for washing clothes and ourselves and one that was pure water for drinking, its amazing the knowledge that Aboriginal people have gathered over thousands of years and is still alive today. With four walking days and 88km’s to cover to Kuthanaru camp we set off for the first day of walking to cover 20km’s, with the temperature soaring to 35 degrees Celsius. The day was long and hot with little shade, but the walkers walked with high spirits to our camp on the side of the road near the Sinclair mine turn off. It was also blowing a gale with dust storms and small willy-willy’s dissecting the road, we arrived tired but in good spirits. Marcus and I had to do a water run to Leonora that took five hours and 170km so we had enough water for the rest of the walk. We arrived back to camp at 9pm, to the sounds of birds, the flicker of campfires and snoring. It was surreal, as usually people would be up laughing around the communal fire, but I guess not unexpected after the days walk. The next day we awoke tired and sore, but still in good spirits, for an early start, another 20km day with temperatures again in the 30’s. Marcus and I decided to drop the km’s down from 23km’s to 20km due to the previous days walk and the temperature, but also so we could camp at Doyle’s well. Doyle’s well is a massive creek system with eight creek crossings, gum trees and an oasis of green grass, it also has allot of bullocks and cows, which have been a constant during the walk. Just near our camp is the ruin of the old settlement at Doyle’s, where there was a thriving community. Not much exists there now except the ruins of buildings and the old swimming pool, with some old Bougainvillea vines that house a colony of Kangaroo rats, we didn’t see them but there where plenty of tracks. We have never camped at Doyle’s before but it was one of the best camps on the walk. 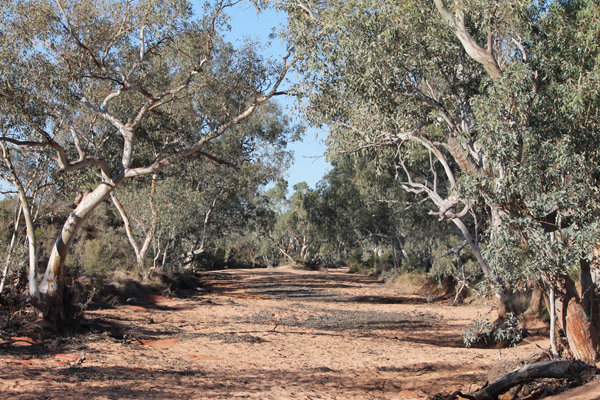 The dry arid conditions that we had become accustomed to seemed to be held at bay by the grass and gum trees that provided a respite from the sun and wind and rejuvenated our spirits. The next two days saw the temperature drop to a comfortable degree which was good as we had two long days of 24km’s until our final rest day. 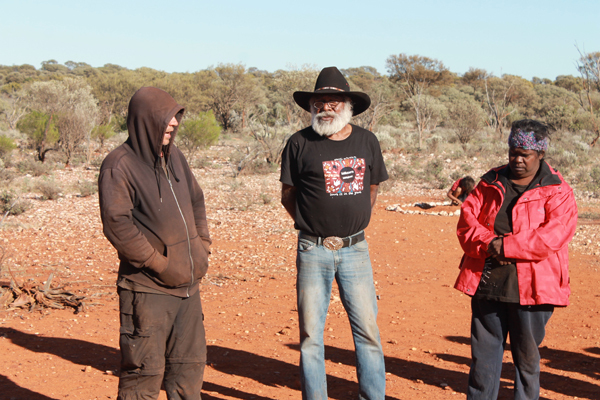 It also saw the arrival of Uncle Glen Cook, a local senior traditional owner who has been a part of the walks every year since we started in Wiluna in 2011. 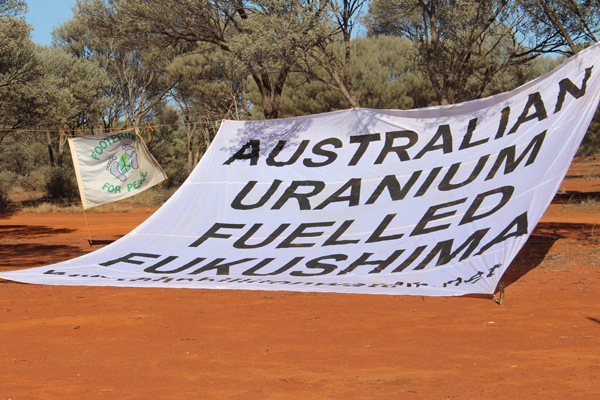 Uncle Glen has been a constant opponent of the Uranium mines in the region often at odds with some people in his own community that are willing to negotiate with the mining companies. Uncle Glen had been delayed due to community commitments and deaths in his family, funerals and deaths in Aboriginal communities are far too frequent and the commitments of Aboriginal people to their communities, families and nations is a foreign concept to most non-indigenous people, but I hope to some degree that the participants on the walk gain a better understanding of what its like for Aboriginal people and the things that have to deal with on a daily basis. The first thing Uncle Glen did when he got out of the car and started to walk with us was to stop at a Mulga tree and talk about it. For us we might just see a tree, but to him he sees boomerangs, spears, tools and food he sees life. He sees the past, the present and the future; he sees a continuation of knowledge and survival. It’s a rare gift to be included so openly in his knowledge but that’s the kind of man he is, open, generous and willing to share his love for country. That night we camped near an old gnarled peppercorn tree, in a rocky quarts camp, gold country. it was a change from the previous camp at Doyle’s, back to the stark beauty of the desert. We also had a night of wind and showers to wash away the dust as people quickly charged their phones to talk to loved ones in the outside world, its a rare patch of mobile reception out here. One more day of walking to our base camp, Kuthanaru, saw the walk cover another 24km, leaving only a 12km day to Leonora. It’s a place that feels like home to most of us who have been walking for the last few years, and a significant part of the local Aboriginal history. Kado Muir’s mother and father set up the camp so that the last of the elders in the community who had lived and grown up in the bush could live out their last years in peace, surrounded by the country that is so ingrained in their souls and traditions, and has become the spiritual home of the walk. There are many old traditional camps and ceremony grounds on the site so we always pay special attention to camp set up, flagging off areas we cannot go into due to cultural sensitivities. This would be our home for the next three days and four nights, an opportunity to regroup, wash and welcome the Aboriginal community from Leonora for the last push into town. We where met there by local elders Richard and Sandra Evans and rejoined by Aunty Shirley and about a million kids. It is always a great last few days where we get to meet all the people from the local Aboriginal community who cannot attend the walk due to work and other commitments. On the evening of the first rest day, the day before we walk into Leonora, Uncle Glen organized some dancers to perform an Emu corroboree. Uncle Richard, described the dance and what it means, “Emu’s when they mate, the female lays the eggs and the male sits on the nest and raises the children. It’s a lesson to us males to look after or children like the Emu does.” The dance was performed by Troy a local Aboriginal man with the kids performing the role of the young Emu chicks and with Uncle Glen singing in language accompanied by Marcus on didgeridoo. 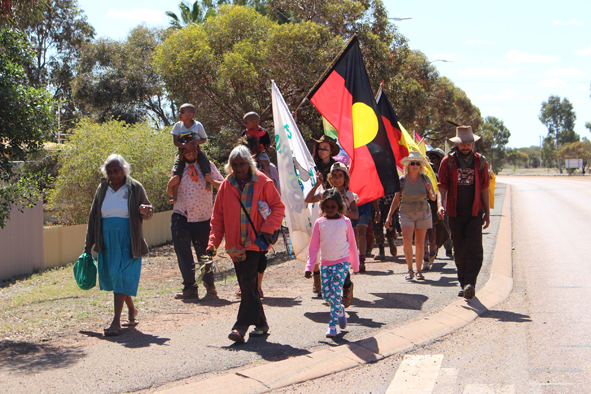 The final day walk into Leonora is a short day, only about 12km but it’s an opportunity for all the walkers and the Aboriginal community (many of whom couldn’t make it to the walk) to show a united and strong voice against the proposed uranium mines. Walkers where met at the Leonora town boundary for the walk into the local park where we all settled into for a long lunch and BBQ. After the lunch the bus whisked some of the walkers off to Malcolm dam, a local swimming spot for an afternoons swimming and relaxation before heading back to camp for dinner of Emu, damper and sing-along’s at the fire. The final rest day before we head off to Kalgoorlie and then Perth is hardly a rest day. It a frantic day of cleaning the truck and buss, stocktaking, packing bags, dealing with lost property and the last closing circle. The closing circle is always an emotional time, its an opportunity for us the walk organizers to hear about peoples experiences, the good the bad and what needs improvement, but also a somber moment where walkers can speak from their heart about their experiences and the eventual reintegration to the outside world. We have all spent the last month in a moving community, living side by side, sharing food, walking country, talking, singing, cooking cleaning and learning to love the flies, dust and each other, its hard to let go of all that, to readjust to the outside world, that for a brief moment in our life didn’t exist. I was honored to hear about every ones thoughts and stories and to see the great changes in peoples lives since we started, the personal growth that was expressed by many is for me, as an organizer, one of the best aspects of doing walks like this. 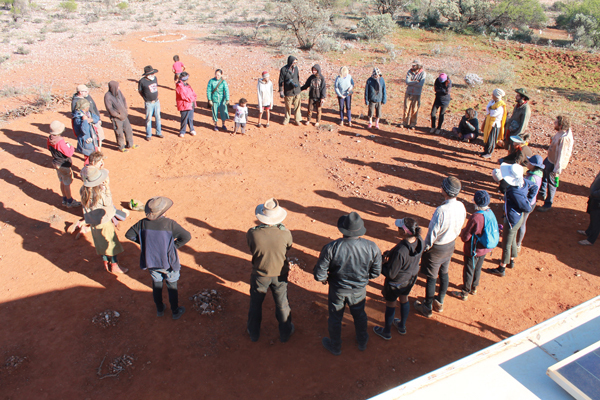 Its an emotional circle, a closure and a beginning, and I hope that the walkers continue to create change both inside themselves and around them drawing on the experience and connection they have gained on country. The next two days are days of driving, covering almost 900km back to Perth with a one night stop in Kalgoorlie at Wongath Bini cultural center where we stayed on the way up. We where joined by Libby and Debby Carmody, who had to leave the walk due to the sudden death of their father, Uncle Geoffrey and Christine Stokes, and Auntie Marcia and her husband Trevor and their family as well as many others from Kalgoorlie. It was great having all of these people back together for one last night, it felt as if the walk had come full circle. It was especially great to see Libby and her family again after the great shock of the death of her father, another time to reconnect, reflect and share. The night was filled with gospel music, guitar jams and of course Ruben on his saxophone, the city lights seemed to fade under the glow of our campfire and the noise of the mining town drifted off as the voices of singing and music filled the air. It was a great last night before the long drive to Perth and the craziness of the city and the end of the journey. The long drive back was grueling, and as we broached the hills to see the city in the distance it filled me with a sense of confusion, on the one hand clean clothes and showers awaited, but on the other hand, the serenity and bush would soon disappear under tar and cement. Luckily we landed in Fremantle at Lian, Claire, Olivia and Lucy’s house, greeted by a camp fire in the back yard, a yummy diner and the local community, it was a nice homecoming and a gentile way to reenter the city, thanks to all those who opened their homes and brought food and great conversation. We also got to see a sneak peek at Rez’s film about the walk; it was amazing, his film style and footage was inspiring. 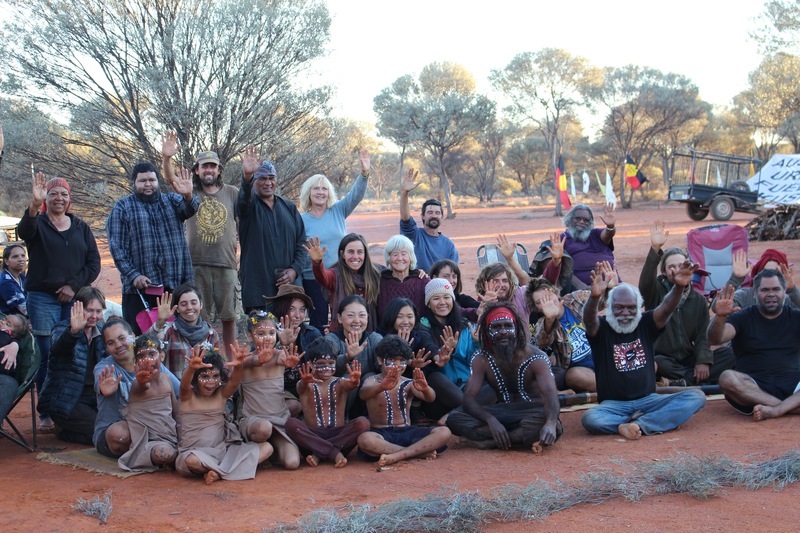 Well that’s another year of the Walkatjurra Walkabout, for me it was a really inspiring group of people and one of the best walks. But it is far more that just walking, so I would like to take this time to thank the too numerous to mention, people who donated, time, money and energy to the walk. To all those who read the updates and posted online, to those who came from Australia and overseas, to the Aboriginal people of the region and through out Australia and the world who are striving for a future free from the nuclear industry and to all the walkers be they there for a day or a month, I would like to extend my deepest respect and love. We will continue to walk for a nuclear free world, one step at a time, and one story at a time, together we can create the change. P.S. AND THAT’S HOW MARCUS RUINED MY LIFE!